Most teachers join the profession because they want to make a difference in children’s lives. They want their students to be the best they can be so they reach their fullest potential. But that is not always easy with large classroom sizes, a wide range of differences of the learners, and the constraints and barriers within the system. There is a process that teachers can do to build a toolkit by teaching to the extremes which were addressed by Dr. Todd Rose in his book, The End of Average. 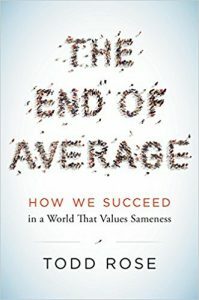 You can read more details about no one being average in my post: Time to Ban Average. A Class Learning Snapshot (CLS) helps you design instructional methods and learning strategies based on four diverse learners in your class or classes. What you come up with for the four learners helps you teach to the extremes instead of to the average learner. You can invite your learners to create Learner Profiles. 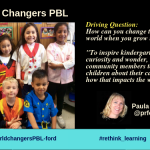 so you have personal information about each learner. I share how Universal Design for Learning provides a process to understand how learners learn best in this post on UDL and the Why of Learning. The CLS is about anticipating four diverse learners at the extremes that you have or will have in your class or classes. You then include their strengths, interests, and challenges using their initials instead of their names or S1, S2… I only added a few bullets for each learner. You can add more bullets or as little as you need for each learner so you can get a snapshot of all your learners. 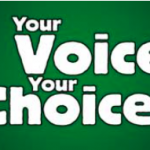 You can ask each of the four learners directly how they prefer or need to learn or you may just want to design this section on what you learned from the CLS. The Class Learning Toolkit (CLT) helps teachers plan for the materials and methods that they need and learners can use during their lessons and projects. When they identify the methods and materials, they then have the resources and strategies at their fingertips when they need it. Before identifying the instructional methods and learning strategies, you can review and research what tools are available and accessible that could support the four learners. Consider how the tools apply to the UDL principles. 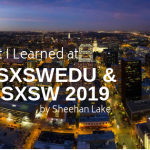 I updated this post after reading Luis Perez’s and Kendra Grant’s wonderful ISTE article 30+ Tools for Diverse Learners. Teachers can create a list of tools and apps that can support their four diverse learners. They can build a chart similar to the one below and include instructional methods, learning strategies, and skills or competencies learners will acquire. These are just a few tools and ideas as examples. The teacher can illustrate a sequence of steps, create a storyboard or use it for brainstorming with a class. Learners could organize ideas for writing a project, break down tasks, or sequence events. The teacher can use this app to demonstrate comprehension strategies by highlighting the main idea and supporting details. Learners can use this app to access books and materials independently or use it as a translator. The teacher can create a class account in a safe place online and make formative assessment easy. Learners can create a digital portfolio and collect evidence of learning. Teacher organizes and model lessons and project materials, graphics and video in a folder/file management system. Learners can use Drive to collaborate with a group or partner and to organize resources in a file management system. Teacher models the tool by creating a book with the class. Learner incorporates his/her own text, images, audio, and video in an original story. 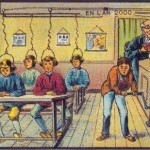 Teacher includes images, audio, and videos to introduce a new concept with interactive tools. Learners can respond to a lesson question, share docs that include original drawings with audio. 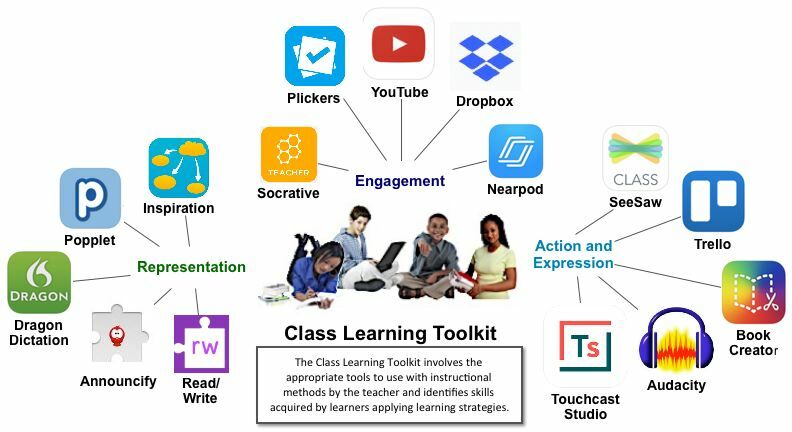 The Class Learning Toolkit is not only about the tools; it is also about instructional methods the teacher uses to support the learners and learning strategies and skills that the four learners will acquire to develop agency. S1 The teacher models a file management system using Dropbox for the whole class. S1 works with a partner who can help him organize files and capture images digitally and other art tools. S1 uses a translator for books, materials, and online resources. The teacher demonstrates Voice Dream as a Text-to-Speech tool for reading comprehension with a small group who want to learn more about Minecraft. S2 uses his headphone and goes to a quiet area to read using the text to speech program. S2 reads Minecraft series to learn how an create an online world. The teacher reviews note-taking skills and brings in Notability as a tool to support writing. The teacher demonstrates Book Creator to the whole class and works closely with S3 and partner. S3 works with a partner to help them take notes using Notability and uses the audio feature to play back for understanding. S3 and partner capture text, audio, and images to create a story together in Book Creator. The teacher uses storyboarding and Popplet (graphic organizer) to demonstrate sequencing in a story. The teacher shares Inspiration for collaborative storyboarding. JR brainstorms order of story using Popplet or drawing with markers on the whiteboard with others in his group. JR learns and then demonstrates Inspiration to others in the class. 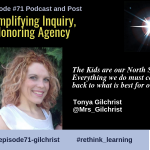 Just imagine a class where all learners are confident and self-direct their learning. The idea of creating a toolkit that includes instructional methods and learning strategies, means the teacher and learners become partners in learning. No one can be an expert on everything. When the teacher steps back and looks at the extremes in the classroom instead of what they believe teaches to the average learner. There is no average learner. Actually, there is no average teacher. This process helps the teacher universally design lessons and activities that engage all learners. If you address learning strategies for the four diverse learners then you will support most of the learners in the class. 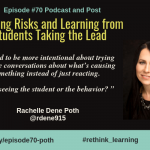 When you identify tools, skills, and learning strategies and how learners can take ownership for their learning, they build skills that help them become future ready. Here are a few questions to consider and let me know what you think. 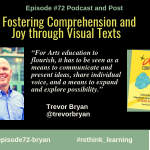 Did you create a Class Learning Snapshot for four learners? What did you learn about them? 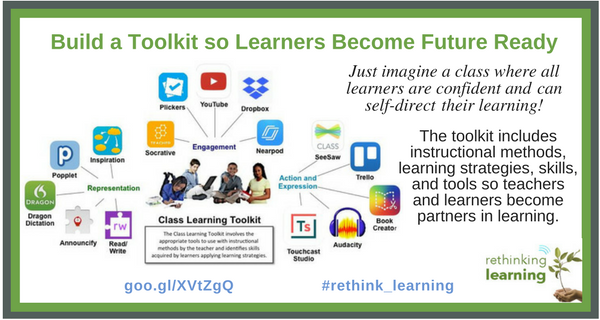 How did a Class Learning Toolkit help you let go so learners take more responsibility for their learning? 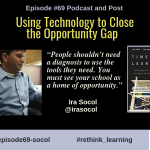 What tools and apps do you see as most effective with the maximum number of learners in your class?